This has been one of my long time favorite beauty items. My best friend Stephanie and I found this in a random store in Syracuse when we were in college. 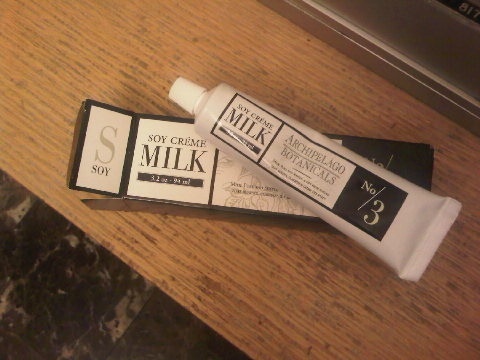 Its by the brand Archipelago Botanicals and the specific product is Milk Soy Creme. It is a tad pricey, not expensive but not cheap, the tube retails for $18.95. This body creme comes in a plastic tube, I love the packaging. Anywho, it is very moisturizing and travel friendly. However, the best part is the smell. I don't know if I can even describe it. It is the most amazing smell ever. Its a very soft, clean and subtle smell but its beyond delicious, I could smell this all day long. I use it all the time just to smell it. Onto the product itself, its moisturizing without leaving behind the greasy feel that I hate. Personally, I will never be without a tube of this! Will you pick this up? Have you tried anything from this line? googling this now to see where I can find it! I use the soy body cream - LOVE it!! You're right, totally not greasy at all yet super moisturizing. Added it to my wishlist on Amazon. I'm wondering if it's anything like the FRESH milk body lotion. It to has a very subtle yet heavenly scent and makes my skin super soft. I definitely couldn't go without it! I adore your blog!! Where can this be found? I live in Iowa and we never have anything good. Thank you for your help!! I just took a look at their website and their products look amazing! I'm definitely interested in the fragrance they have of that body creme. 1 i love your blog and your youtube tutorials/reviews! so thank you! 2 i had to add my fav skin care line and wanted to see if anyone else used it--Eminence Organics. this stuff is AMAZING. organic products (huge line) that feels and smells just awesome. i'm pretty sure you can actually eat the stuff. HIGHLY recommend. tad bit expensive but 100% worth it! This looks SO nice, I'm definately going to try it if I can get my hand on it all the way in australia! I also put your blog link in my most recent post. - Where do you work at? - Who is you favorite deisgner? - How is the life in New York? Im sure that there is many of your viewers who would love to know more about you. I do!